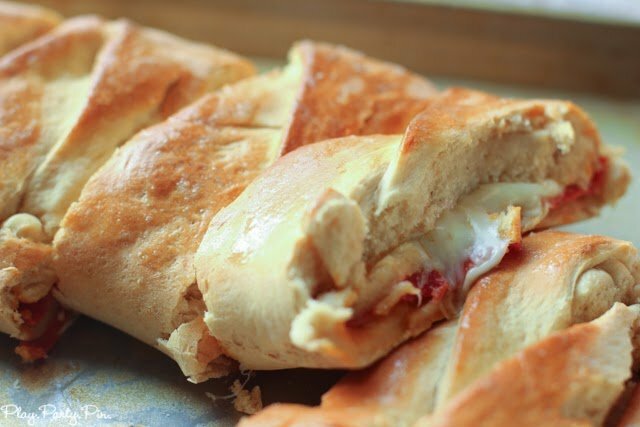 Pizza loaf is the perfect way to eat pizza with friends. 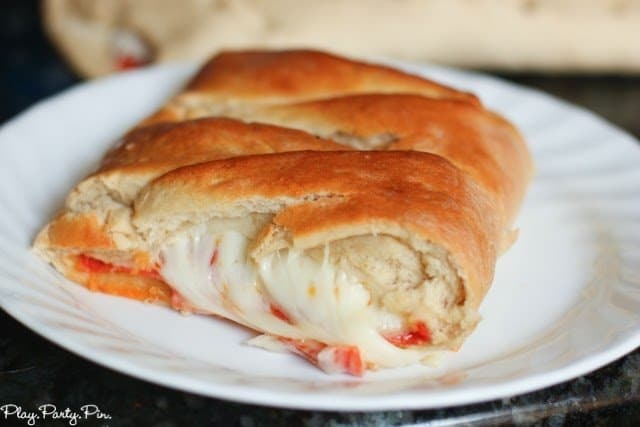 Top pizza dough with your favorite pizza toppings, braid them inside, and bake for one delicious slice of pizza loaf. This my friends is my all-time favorite meal. 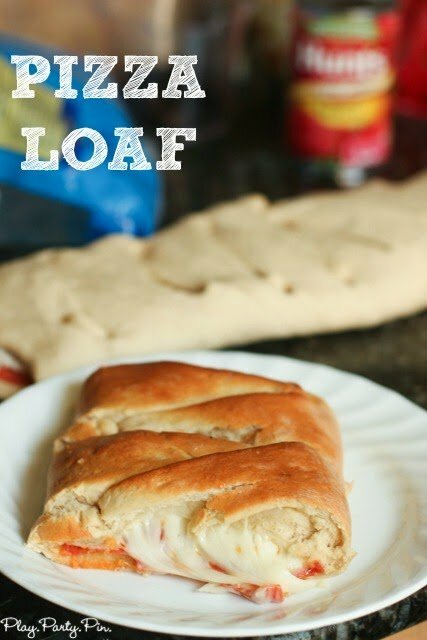 It may not be fancy or gourmet, but pizza loaf is a meal that I eat with my family pretty much every time we’re together. And when asked what I would want for my last meal, it would be pizza loaf with striped delight. Hands down. Because pizza loaf is all of your favorite toppings braided into pizza dough, and it’s delicious. 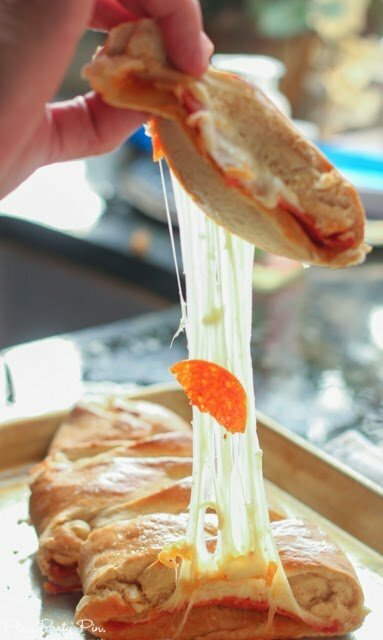 While I prefer this filled with pizza filings, you can always take the same idea and turn it into sandwich loaf (another family favorite), breakfast loaf, or even something more complicated like chicken Alfredo loaf. The process is the same; the filling is just a little different. Here’s how you make it. 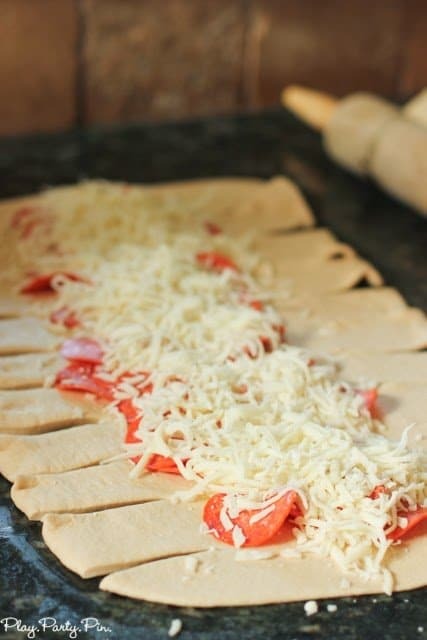 Step 1 – Make or buy your favorite pizza dough and roll it out in a long oval shape. 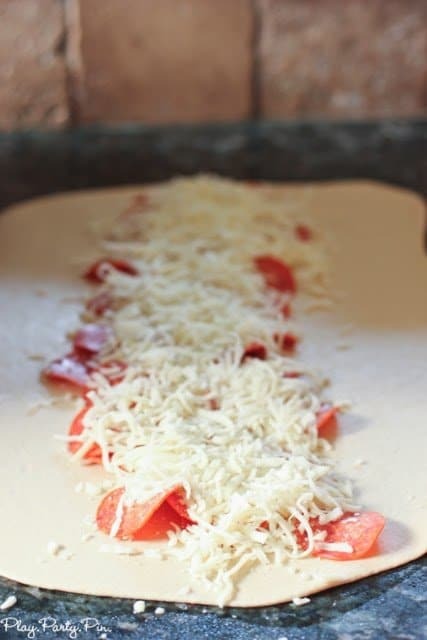 Step 2 – Line the middle of your pizza dough with toppings, leaving a couple of inches of dough all the way around the toppings. 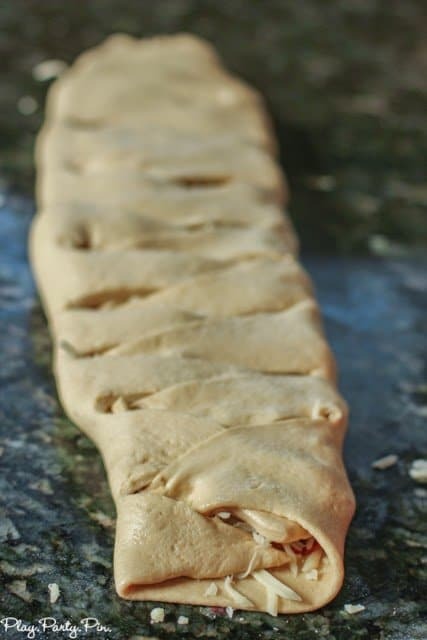 Step 3 – Using kitchen scissors, cut one-inch cuts along both sides of the dough, leaving the ends uncut. 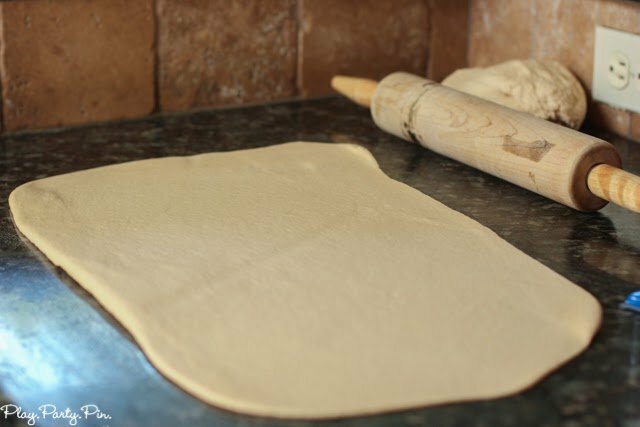 Step 4 – Starting on one end, fold the end of the dough over the toppings, and then pull the one-inch cuts of dough across the toppings, alternating sides. Step 5 – Bake the pizza in the oven at 425 degrees for 15-20 minutes or until the dough is fully cooked and lightly browned. Remove from the oven and butter the top before serving hot. Step 6 – Slice with a pizza cutter and serve hot with your favorite pizza sauce for dipping. Or serve it at room temperature or cold; it really doesn’t matter, it’s delicious regardless. 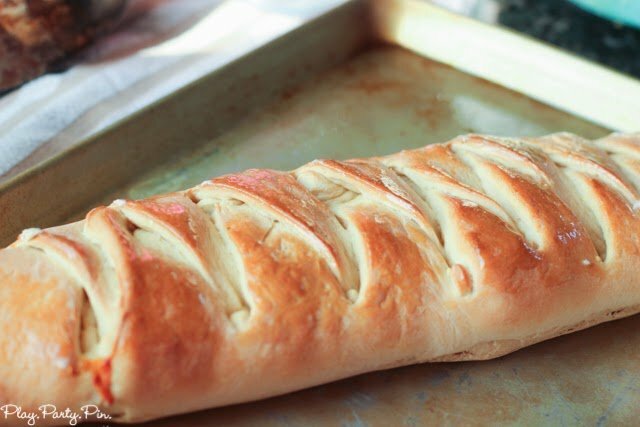 I make a lot of loaves like this and Strombolis., but I always have trouble getting them cooked all the way through, but I’ve been rolling them up. I’m going to try this next time, its prettier too! We never have issues getting it to cook all the way through Krista so definitely try it! Thanks Elle! And I love your name. What brand of pizza dough did you use for this? It looks delicious! I actually made my own for this one. I’ll be posting a recipe soon! This looks so good! I’m definitely going to have to try it. Thanks for sharing! mmmm, looks delicious, I think I will try it soon for my family. is there no sauce on this? Nope, we dip it in pizza sauce! Hope you enjoy. Wow! I’m going to try this way of folding the dough . It looks yummy. As beginner in baking I love to try new ways as variation . THANKS! Is there sauce in there? I couldn’t tell. No sauce Cindy, just the pizza and then you dip it in sauce! You could probably add sauce if you want, but it’d likely fall out the sides and be a lot harder to fold! 425 or 350 and…… no need for a pizza stone? So sorry Lorraine, cook it at 425 and we use a pizza stone, but it’s not necessary.